NOT ALL RUBBER IS THE SAME! If you are looking for ballistic control rubber, don't settle for version 1.0. Don't settle for rubber that has been ground and reglued into a new shape. Performance is important. Upgrade. Start here. 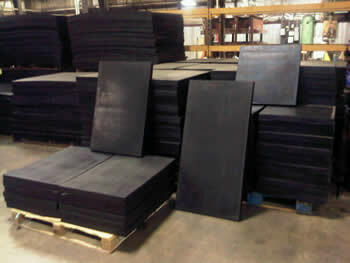 Black Iron Rubber Co. has produced vulcanized rubber panels, blocks, sheets and curtains for ballistic control in military, law enforcement and private ranges for years (see clients page). 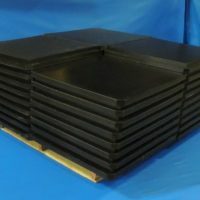 We specialize in producing custom rubber with dimensions as small as 1” x 3” x 7” up to 2” x 48” x 96” sheets weighing almost 400 pounds. Not all rubber is made the same. If you do a little research you will see (see attached .pdf info on vulcanized vs. binder technology). Start with BIRCO. 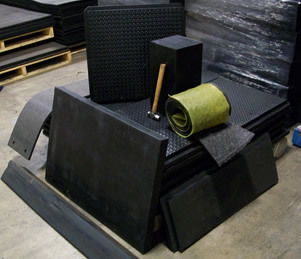 Ballistic rubber is used to prevent escapes and ricochets in gun training ranges. Rubber can stop some rounds (depending on the thickness) but usually not. The rubber allows the bullets to pass through it and then strike a hard surface. Then its energy and original shape are lost so it safely comes to rest between the rubber and the hard surface (usually steel). The physical properties of rubber polymers have been measured scientifically for years. Most properties are measured by impacting stress to the rubber. Tests like tensile strength, durometer, modulus, and density are routine rubber tests. A test called “ultimate elongation” is a crucial property in ballistic control rubber performance. Elongation is measured by taking a sample piece of the rubber and stretching it until it breaks. When a bullet round strikes rubber, the rubber should stretch and allow the bullet to pass through and then rebound to its original position allowing it to take a high number of strikes while preventing escapes. 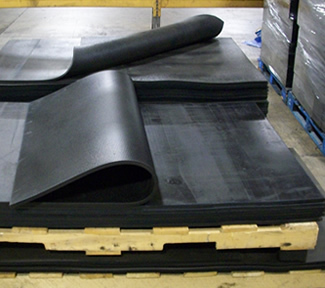 Our rubber will stretch to about 200% of its original size. Please ask any of other ballistic control manufacturers you are considering to provide their material testing data on the properties we listed above. Ours has been tested by the Akron Rubber Development Laboratory. Our competition has been making “grind and glue” rubber and claiming that it has been made originally and exclusively to be shot at in ranges. What they are really saying it has been made to be replaced. One of our competitors claims to be the first to manufacture ballistic control rubber. Being first doesn’t always mean the best (Motorola made the first cell phone)! They claim their rubber has been tested by Picatinny Arsenal, among a few others. But the test is only with their product! There is no direct performance comparison with a competitor, and we know why. They have been hyperactive in their attempts to disparage our vulcanized product because of the low quality and poor physical properties their rubber possesses. While their product has not changed in decades, we continue our efforts to improve our product. They sell their product by volume, not weight. 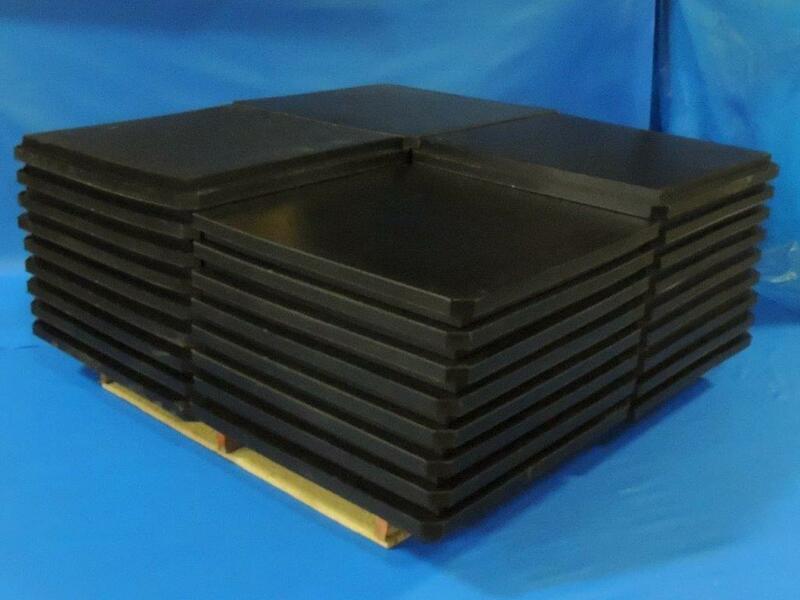 For example, their 9” x 12” x 24” D- Block weighs about 78 pounds. 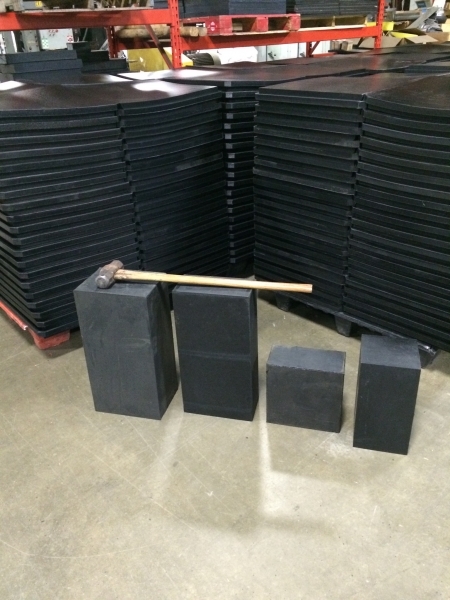 Our block with the same dimensions weighs 105 pounds, over 25% higher density! They claim that no other manufacturer can match their capabilities. Well, we do not want to match them, we go beyond them. Not all rubber is made the same. For a grind and glue product sized reduced tire crumb is mixed with either a polyurethane binder/liquid latex in something as simple as a cement mixer, stir it all together and then put it in a mold, add pressure, and out it comes. Very simple process. Takes minutes. 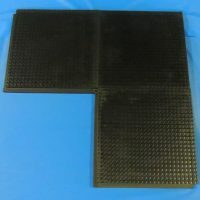 For our product we batch virgin rubber/oil/curing chemicals/tire crumb and fire retardant and load the recipe in what is called an internal mixer. That compound is then compression molded. 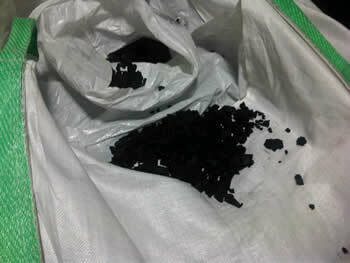 The product becomes cross linked at the molecular level, called vulcanization. This technology is the same as making automotive tires and yields a strong yet resilient product. We are constantly looking for ways to improve our product. We appreciate you taking the time to read this and please call with any other specific questions or suggestions you may have. can be downsized and other sizes may be available upon request. 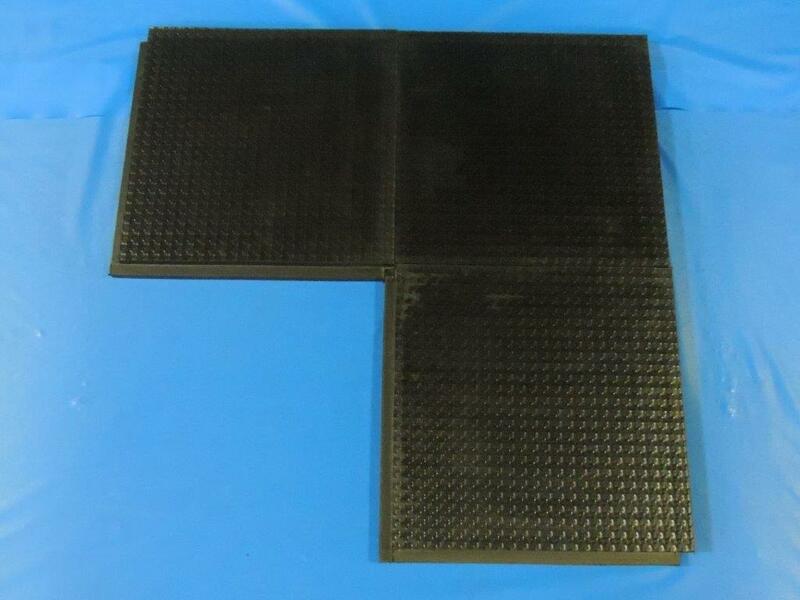 BIRCO has designed a ballistic rubber panel with a 1" x1" inset around the perimeter. The panel has a textured surface on both sides to allow the panel to be "flipped" and seat with the panels adjacent to it. This safety feature prevents gapping at the seams where rounds can escape control. This design also minimizes waste, where a section can merely flip over to fit in another area of the ballistic control system. 9" x 12" x 24" - 105 pounds ea. 6" x 12" x 24" - 72 pounds ea. 6" x 12" x 12" - 36 pounds ea. 8" x 8" x 16" - 41 pounds ea. The blocks can be custom manufactured with a high carbon steel screen(s) molded within the block to enhance bullet defeating properties! Email or call us for a quote today. 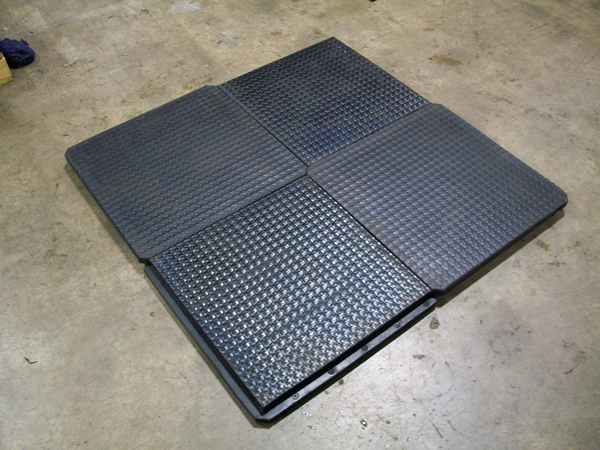 Size fraction: 0.5"-1.5" Made from size-reduced molded rubber parts - NOT TIRES! No steel, fiber or other contaminants. Absolutely NO tracer rounds should be used with ANY rubber panel, block, or media material. Please contact us today for a quotation on Ballistic Control Products.